Previously sold at Sotheby's Hong Kong, 15 November 1988, lot 223. This flask is exceptional in its rarity of form, in the design of the flower scrolls, and in the arrangement of the trigrams Qian and Long on opposite sides of the flask to form the Imperial reign title. Two other flasks of this design have recently been sold at auction, at China Guardian, Beijing, 23 April 2002, lot 952, and at Beijing Hanhai, 12 January 2004, lot 2389. 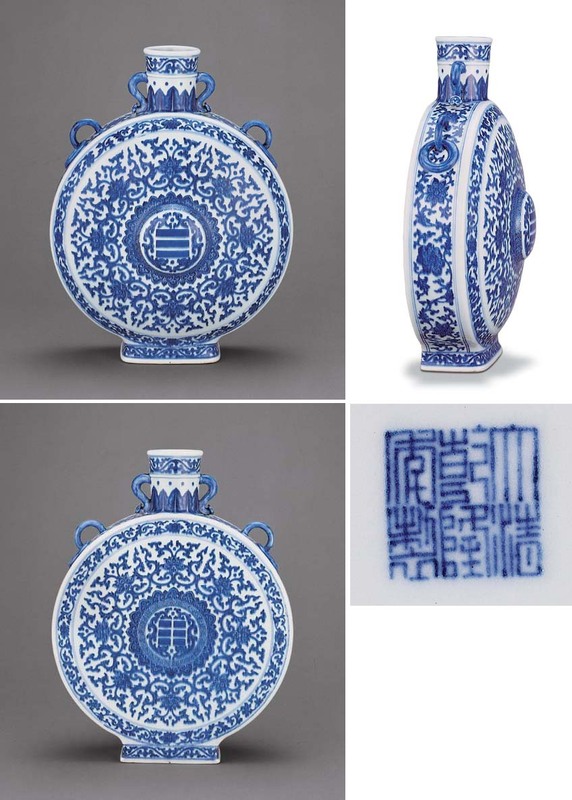 The form of this moonflask was clearly inspired by Yongle blue and white examples, which themselves were based on thirteenth-century Islamic brass prototypes. Examples of the early fifteenth-century porcelain flask include four in the Palace Museum, Beijing, illustrated in Blue and White Porcelain with Underglazed Red (I), The Complete Collection of Treasures of the Palace Museum, Hong Kong, 2000, pls. 34-37; one in the National Palace Museum, Taiwan, illustrated in Blue-and-White Ware of the Ming Dynasty, Book 1, Hong Kong, 1963, pl. 3; one in the Freer Gallery of Art, Washington D. C., illustrated in Oriental Ceramics, Kodansha Series, Japan, 1981, pl. 94; and another sold at Sotheby's Hong Kong, 1 November 1999, lot 311. Compare the Ming and Qing versions of the flask with the Middle Eastern canteen made of brass inlaid with silver, also in the Freer Gallery of Art, illustrated and discussed by John Alexander Pope, 'An Early Ming Porcelain in Muslim Style', Aus der Welt der Islamischen Kunst. Festschrift fur Ernst Kuhnel (ed. Richard Ettinghausen), Berlin, 1959, pp. 357-75, pls. 1B and 2B, where the porcelain and metal flasks from the Freer Gallery are compared. Both prototypes have a flattened back and a slightly domed front, although the Yongle examples are not decorated or glazed on the flat side, while the Islamic flask is inlaid on both sides. The loops on the eighteenth-century flask are taken from both prototypes, as the porcelain ones have only a pair on the shoulders and the metalware example has only the S-shaped handles flanking the neck. The rectangular feet on the Qianlong flask is a Qing-dynasty addition, as neither of the earlier pieces were designed to stand upright for display purposes. As a functional object, the metal canteen was probably suspended from a horse's saddle, with the flattened side designed to lie flat on the saddle or on a piece of luggage. The painted decoration of flower scrolls on the present moonflask is slightly more stylised than those found on the early Ming flasks. The trigrams on the central medallion belong to the Eight Trigrams or ba gua, traditional symbols of divination which were recorded in the Yi jing, Book of Changes.